Did you know that QuoteWerks has more integration points than any other Application Solution Provider (ASP) that partners with Tech Data? With the latest enhancement, Tech Data customers can quickly turn a quote created for them by their sales rep into a quote for their customer. QuoteWerks is the first commercial CPQ solution to implement the new Tech Data XML API service that enables IT sales professionals to retrieve all quotes created for them via Tech Data. This visibility enables Tech Data customers to quickly produce a quote or proposal for their customers without the need for manual entry or copying and pasting which are both error prone. QuoteWerks is a highly effective tool that seamlessly integrates into our system, removing human error and increasing productivity for our partners. MSPs use QuoteWerks to quote products and services that they source from Tech Data and other IT Distributors. IT Professionals routinely rely on their distributor's sales reps to provide them with quotes that contain special pricing or specially configured systems. These quotes need to be entered into the document that they will eventually provide to their customer. The quote integration with Tech Data has evolved over the past three years. Initially, QuoteWerks users could import quotes that they Tech Data sales rep created for them. This was a problem because of the time it took to receive the quote and also the fact that spam filters would routinely remove file attachments from emails or the email would not be received at all. 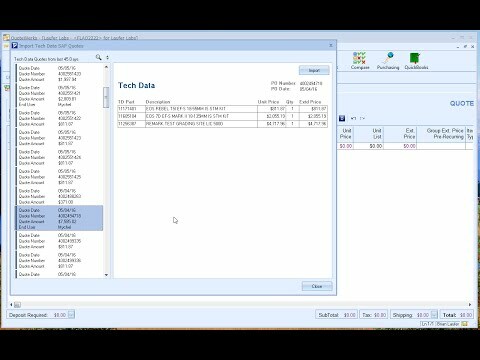 Tech Data then added an XML API interface that enabled QuoteWerks users to simply enter a Tech Data quote number into QuoteWerks and the quote would be retrieved electronically, in real-time while on the phone with their sales rep. This required the customer to know the quote number and they did not know what was on the quote that they were about to import. This new QuoteWerks functionality enables the Tech Data customer to see all quotes available to them from the past 45 days. They have the ability to scroll through all of the quotes and see a preview of what is contained on the quotes. They still have the ability to manually enter a quote number if they want to quickly preview a quote before importing it. The imported document uses the markup defaults already configure in the system. Using the QuoteWerks Product Content Subscription powered by Etilize, the QuoteWerks user with a click of a button, can enhance the look and feel of the quote with spec sheets, customer friendly descriptions, and pictures. In addition to the Quote functionality, Tech Data customers have the ability to retrieve real-time pricing and availability by warehouse, place online orders, and even receive orders in real-time within QuoteWerks. Orlando, FL, (PRWEB) May 26, 2016 — Aspire Technologies, Inc., the market leading provider of sales quoting and proposal software solutions, announced today the release of QuoteWerks version 5.1 build 6, which provides customers access to Tech Data quotes, created by their Tech Data sales representatives, using Tech Data's quoting system. "We partner with Application Service Providers (ASPs) like QuoteWerks because we want to provide the best customer experience for our resellers," said David Spindler, director, e-Business at Tech Data. "QuoteWerks is a highly effective tool that seamlessly integrates into our system, removing human error and increasing productivity for our partners." Professionals in the information technology (IT) industry routinely rely on their distributor's sales representatives to assist them with product selection pricing, specially configured systems and other value-added services. QuoteWerks integration eliminates the need for custom-tailored quotes to be manually entered into a reseller's quoting tool, removing the potential for human error. Additionally, QuoteWerks customers can quickly customize, format, finalize and deliver the quote to customers via an interactive quote delivery system. QuoteWerks Product Content Subscription, powered by Etilize, refreshes line items in a QuoteWerks document with pictures, customer friendly descriptions, marketing summaries, optional items and specification sheets. The process, which once required users to review multiple websites, manually transfer and update information into the document, is now fully automated through the QuoteWerks integration. "QuoteWerks is the leader in this space, innovating in areas not previously explored in the industry," said John C. Lewe, QuoteWerks founder and president at Aspire Technologies, Inc. "This strategy has solidified QuoteWerks as the integration leader by offering integration options not available in other applications. QuoteWerks has more integration points than any other ASP currently partnering with Tech Data. " "Aspire came to Tech Data with this innovative integration request, and their e-Business team implemented it very quickly for such a large organization," continued Lewe. "Known for their technical innovations, Tech Data recognized the importance of reducing the time it takes for a reseller to get quotes to their customer, and we're proud to partner with them." QuoteWerks is the first Configure Price Quote (CPQ) solution to implement the new Tech Data XML API service, which allows IT sales professionals to retrieve available quotes directly through Tech Data.